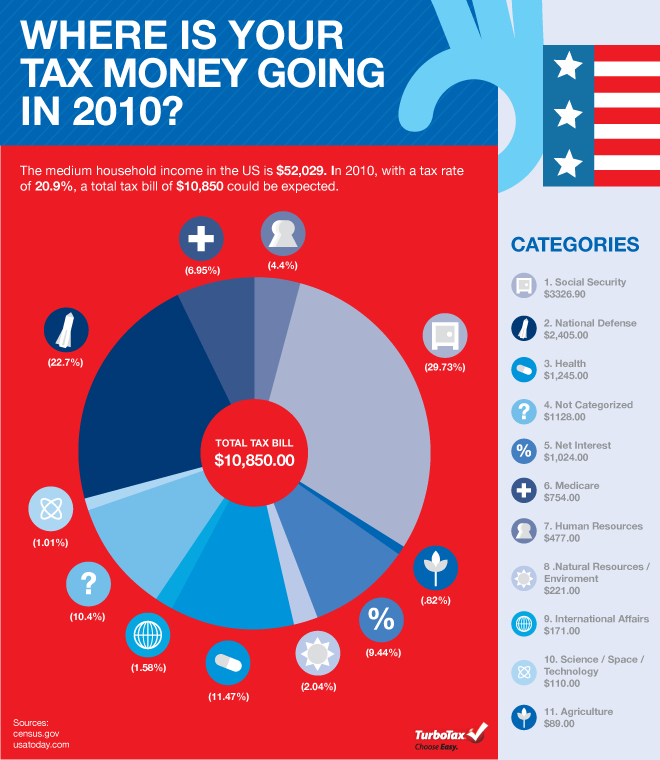 The TurboTax Blog > Tax Tips > Where Is Your Tax Money Going in 2010? Where Is Your Tax Money Going in 2010? According to the most recent Census study, the median household income in the US is $52,029. So, in 2010, with a tax rate of 20.9%, a total tax bill of $10,850 could be expected. But have you ever wondered where these tax dollars went? The graphic below illustrates the distribution of an average household’s tax dollars, by category and dollar amount. Some of the figures may come as a surprise. You ought to be a part of a contest for one of the most useful sites online. I’m going to recommend this site! Thank you. Glad you like it. Check back for more interesting topics. What types of things are included in these breakouts? I wish to pay 0% for National Defense.